My lovely friends Oli and Emily got married at the weekend in Albany, Oregon. Unfortunately we couldn't afford to get over there to join them, but it sounds like it would have been a lovely day. We were really sad not to be able to be there, but we sent them some nice things. 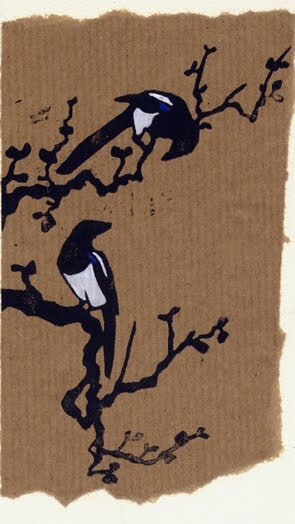 Rowan did them a drawing from a photo we took outside their garden when they were living in the hills above Tarifa, Spain, and I made them this Magpie card. We also sent them a nice new copy of my Folio Society Beowulf- I was reading the poem in preperation for the Folio project the last time we visited them in Spain, before they left for America. Happy marriage Oli and Em!